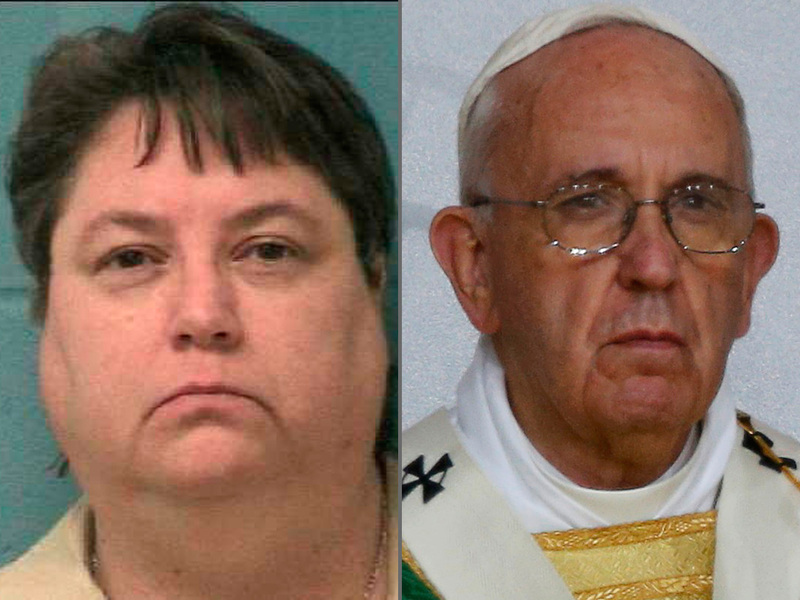 ATLANTA -- Pope Francis has asked the Georgia Board of Pardons and Paroles not to execute Kelly Gissendaner, the sole woman on the state's death row who was scheduled to be executed Tuesday night, according to a letter from a representative of the Pope published on the website of the Catholic Archdiocese of Atlanta. Tuesday afternoon, the board declined clemency for Gissendaner, after holding a meeting to gather additional information from her supporters. Before the board announced its decision, Wilton Daniel Gregory, Archbishop of Atlanta, said the board received the letter in time for the 11 a.m. meeting. The board did not give a reason for its decline after it met on Tuesday, saying only that it had carefully considered her request for reconsideration. The Pope sent the letter today via Apostolic Nuncio Archbishop Carlo Maria Vigano, his diplomatic representative in the U.S., according to the archdiocese. "While not wishing to minimize the gravity of the crime for which Ms. Gissendaner has been convicted, and while sympathizing with the victims, I nonetheless implore you, in consideration of the reasons that have been expressed to your board, to commute the sentence to one that would better express both justice and mercy," Vigano wrote. The Pope, who is back in Rome after a six-day visit to America, called for the abolition of the death penalty while he was in the U.S. In an address to the Joint Session of Congress last Thursday, Pope Francis said, "This conviction has led me, from the beginning of my ministry, to advocate at different levels for the global abolition of the death penalty. I am convinced that this way is the best, since every life is sacred, every human person is endowed with an inalienable dignity and society can only benefit from the rehabilitation of those convicted of crimes," according to the letter. Vatican spokesman Father Federico Lombardi told CBS News it's common for the papal nuncio to ask for clemency in a death penalty case, on behalf of the Pope. "Certainly soon after making his appeal to Congress to abolish the death penalty [Pope Francis] was certainly watching any cases that might be on the horizon," Gregory said Tuesday. "I suspect this would be the first such case." The 47-year-old Gissendaner was convicted of murder in the February 1997 slaying of her husband. She conspired with her lover, who stabbed Douglas Gissendaner to death. Gissendaner was scheduled to die by injection of pentobarbital at 7 p.m. at the state prison in Jackson, but her lawyers filed a last minute appeal that delayed the process. She would be the first woman executed in the state in seven decades. Jane Hansen, public information officer for the Supreme Court of Georgia, told CBS News Gissendaner's lawyers appealed to Butts County Court and Fulton County Court for a stay of execution sometime late Tuesday afternoon. Both courts denied the appeal, so it went to the Georgia Supreme Court and the U.S. Supreme Court. Those courts then also denied the appeals. Two of Gissendaner's three children already asked the board earlier this year to spare their mother's life. Her oldest child, Brandon, who had not previously addressed the board, now wants to make a plea for his mother's life, said Susan Casey, an attorney for Gissendaner. Gissendaner's supporters on Sept. 19 released an emotional video featuring two of her three children begging for her not to be executed. "Forgiving our mother was the best way to truly honor our dad's memory," Dakota Gissendaner, who was 5 when his father died, said in the video. In the video, Kayla Gissendaner said she didn't believe her father would want her mother to be executed to spare his children from more pain. She said her mother has grown and changed while she has been in prison, describing her as "my biggest cheerleader." "We lost our dad. We can't imagine losing our mom too," Kayla Gissendaner said. On Monday, a federal judge denied Gissendaner's emergency motion for a stay of execution, and her lawyers said they would appeal the ruling to the 11th U.S. Circuit Court of Appeals. Gissendaner was previously scheduled for execution on Feb. 25, but that was delayed because of a threat of winter weather. Her execution was reset for March 2, but corrections officials postponed that execution "out of an abundance of caution" because the execution drug appeared "cloudy." The parole board, which is the only entity in Georgia authorized to commute a death sentence, declined to spare Gissendaner's life after a clemency hearing in February. Her lawyers asked the board to reconsider its decision before the second execution date, but the board stood by its decision to deny clemency. Gissendaner's lawyers last Thursday submitted a second request to reconsider the denial of clemency. The parole board said Monday that its members have thoroughly reviewed that request. The board said the meeting Tuesday would allow it to gather additional information from representatives for Gissendaner. In the request for reconsideration, Gissendaner's lawyers cite a statement from former Georgia Supreme Court Chief Justice Norman Fletcher, who argues that Gissendaner's death sentence is not proportionate to her role in the crime. Her lover, Gregory Owen, who did the killing, is serving a life prison sentence and will become eligible for parole in 2022. Fletcher said he has now decided he was wrong in voting to deny Gissendaner's appeal in 2000 when he sat on the state Supreme Court, the statement says. He also notes that Georgia hasn't executed a person who didn't actually carry out a killing since the U.S. Supreme Court reinstated the death penalty in 1976. Gissendaner's lawyers also argue she was a seriously damaged woman has undergone a spiritual transformation while in prison and has been a model prisoner who has shown remorse and provided hope to other inmates in their personal struggles. The new request for reconsideration includes testimony from several women who were locked up as teens and who said Gissendaner counseled them through moments when they felt scared, lost or on the verge of giving up hope. Douglas Gissendaner's family said in a statement released Monday that he is the victim and Kelly Gissendaner received an appropriate sentence. "As the murderer, she's been given more rights and opportunity over the last 18 years than she ever afforded to Doug who, again, is the victim here," the statement says. "She had no mercy, gave him no rights, no choices, nor the opportunity to live his life."